It proved wonderful for genealogy to have a great grandfather with the middle name of Rathbone. We knew the Fisher family came from the Gawsworth area of Cheshire and when we found Rathbone graves in the churchyard there we recorded them because of that middle name of Rathbone. Later research proved that Rathbones were direct ancestors. Abraham was born in 1871 in Ardwick which is now a part of Manchester. His Gawsworth born father had become a policeman in Manchester. In 1871 he was a Constable but he rose through the ranks as young Abraham grew up and by 1891 he was an Inspector. Abraham was a postman by 1891 and in 1893 he married Mary Ann (always known as Polly) Robinson. They were able to acquire a ‘sell everything’ shop in Macclesfield. It was right next door to the Flowerpot Inn. This was probably a bad thing, for Abraham was fond of drink and, we gather, he spent far too much time and money at The Flowerpot. A photo found in a book about old Macclesfield seems appropriate. Polly, in the white apron stands outside their home and shop. Abraham leans on the nearer window of The Flowerpot. 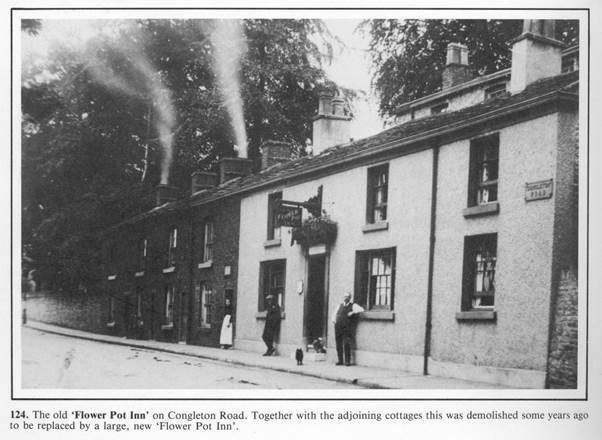 As the caption says, pub and cottages have all gone now and a bigger pub has been built. A good piece of luck to come across this picture. Even better that an aunt was able to positively identify the people.